As a specialty product in The Next Generation of Turf Nutrition™, STS Summer 7-0-9 provides both nitrogen and potassium, along with a complete and balanced micronutrient package. 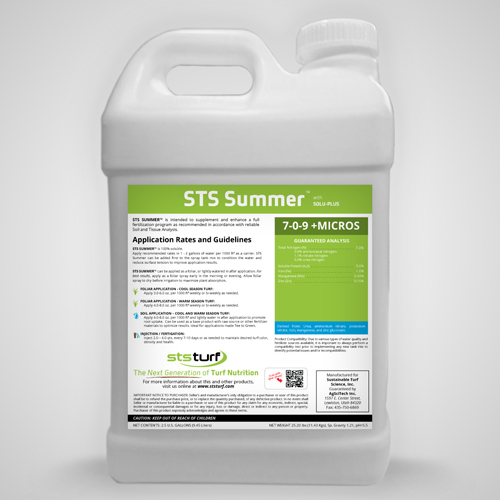 STS Summer 7-0-9 reduces stressful conditions by maximizing the efficiency of water use and plant respiration. When it’s critical to maintain carbohydrate production during heat related stresses – STS Summer 7-0-9 delivers! STS Summer 7-0-9 includes 12 of the 16 essential nutrients, and also contains our Nutrient Mining Technology™, Solu-Plus, which maintains nutrient availability to ensure plant absorption efficiency. STS Summer 7-0-9 contains our natural plant fermentation extracts, and cold processed kelp to enhance chlorophyll production and improve drought tolerance. STS Summer 7-0-9 will also aid in the buffering of detrimental salts associated with poor quality water, especially during periods of intense irrigation.